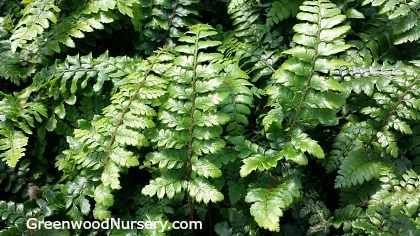 The Tassel Fern is a slow growing evergreen fern that will add an elegant touch to your shaded garden. It is called Tassel fern due to the way the new fronds droop to form a 'tassel'. Beautiful as a ground cover in lightly to fully shaded areas such as woodland settings, surrounding heavily canopied trees and shrubs, under covered arbors or northern facing gardens. An excellent perennial plant for adding to a Japanese garden setting, container gardens, or blending with other larger growing ferns. Great companion plants for the Tassel Ferns are heucheras or Coral Bells, hostas, columbine and dicentral or bleeding heart perennial plants.